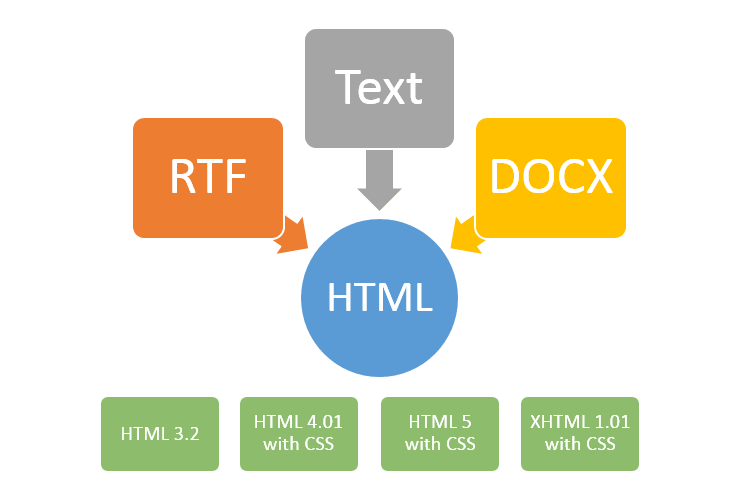 RTF to HTML .Net - converts RTF, DOCX to HTML! Forms, Fonts, Images, Lists, etc. Read DOCX (Office Open XML). Specify HTML version: 3.2, 4.01, 5, XHTML. Ability to generate only part of HTML, between body tags. Specify CSS: internal or inline. Images: Local and Embedded with base64. Full Unicode support: Chinese, Korean, Arabic, Russian etc. Tables (borders, background, nested tables, merged cells, nested tables). Requires only .Net 2.0 or higher. Absolutely standalone, No dependencies of MS Office or other. Only single dll: SautinSoft.RtfToHtml.dll, 1Mb. New versions every three months (HotFixes). Free Updates during one year. An answer during 24 hours.